As I was not making any progress on other projects for one reason or another I decided to build the Fox Delta WX1 weather station kit that had been sitting in a drawer for the past couple of months. For several years I have had a simple wireless weather station that tells me the outside temperature, humidity and pressure. Since getting into APRS I wanted to be able to put this information on the network. Most of the weather station products I've seen interface with a PC using some proprietary software, which ties you down to a particular operating system. It also typically interfaces with APRS using some proprietary method that works with UI-View but is not supported by APRSISCE. The elegant solution would be a weather station that transmits the weather information as an APRS packet using a low power RF link, which would then be received by my VHF IGate. When I discovered that the WX1 produced 1200baud AFSK audio output and a PTT signal to control an external transceiver to do exactly that it seemed just the solution I was looking for. Unfortunately the WX1 was no longer for sale from the Fox Delta website. 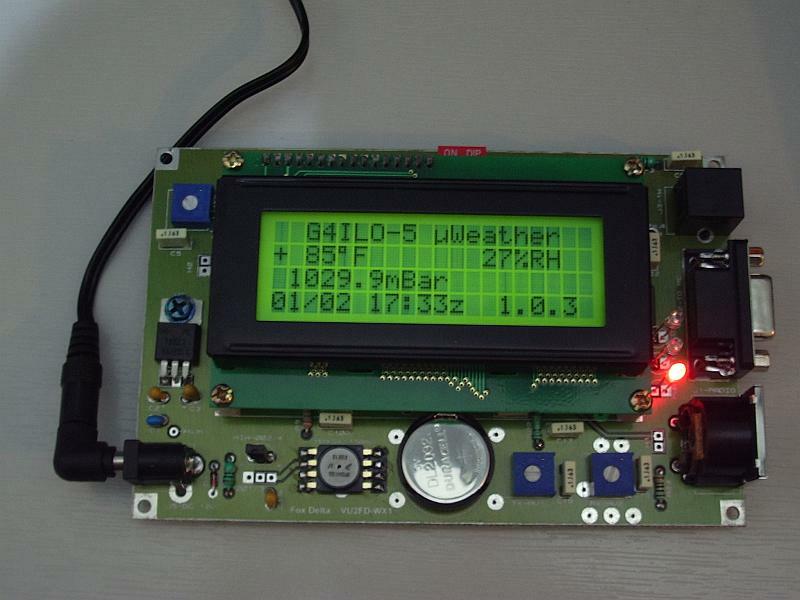 I contacted Dinesh, the proprietor of Fox Delta and he explained that although he still had a couple of boards and most of the parts for the WX1, the kit needed to be redesigned to support the latest 1-Wire anemometer so he had taken it off the market. I told him I didn't want an anemometer. Our garden is so tiny and surrounded by houses, trees and bushes that I would never get an accurate reading anyway. Besides I didn't think Olga would be thrilled to have an anemometer planted in the middle of her flowers. And from what I've read, most of these home weather station anemometers fail after a year or so. So Dinesh agreed to sell me a kit and I had to take up the offer there and then even though it hadn't been something I'd planned on doing right away. The weather station turned out to be quite easy to build despite the fact that there are no detailed step by step instructions, just a parts list, a schematic diagram and the silk-screened PCB to show you where each component goes. Most of the parts were supplied in individually labelled small polythene bags which helped a lot. I had a nasty moment after I soldered in a crystal X1 and then realized the second crystal on the board was also labelled X1. But the two devices were in a completely different form factor and would not match the outline in the wrong place so there was little chance of a mistake. Amazingly, for something built by me, it worked first time. I set up the weather station running standalone in our unheated conservatory and I was disappointed to find that the temperature readings were several degrees on the high side. I was also disappointed that the configuration software provided no way to change the display of temperature from Fahrenheit to Celsius. The sensors for temperature, humidity and pressure are all mounted on the board itself. I had thought that I would be able to extend them via a cable so the sensors could be outside and the weather station inside but on closer examination I could see that was not going to be practical. The temperature sensor chips are actually underneath the LCD display and it appeared that the LCD backlight may have been contributing a bit of local heating. Given that the unit will have to live out of doors, the display will not be particularly useful. In fact, the instructions state that if you want you can take it off to save power. So the problem of high readings and the Fahrenheit display can be resolved simply by removing the LCD, which as it is a standard display panel, can probably be used in another project. I tried it on my EasyPIC5 development board and it displayed some demo text. The plan is to use the Radiometrix TX1 10mW transmitter module that I recently bought for the 144.800MHz RF link. However to get the weather station on the air quickly I made up a cable to try it with my old Kenwood TH-205E. I put them in the garage to get close to the outside temperature, and one problem quickly reared its head. As with the FoxTrak I found that the PIC-based circuit is extremely vulnerable to RFI. Even 0.5W into a short Nagoya dual band antenna on the Kenwood was enough to cause loud buzzing on the audio and once to lock up in transmit and corrupt the atmospheric pressure calibration. The rather poorly made case provided by Fox Delta offers very little in the way of screening, especially with the aperture for the LCD display. Hopefully the 10mW produced by the Radiometrix module won't necessitate the elaborate screening measures that were required by the FoxTrak. Congrats on the "works the first time" construction project! I'm anxious to see your weather station come on the air. What -SSID are you planning to use? I see G4ILO-5 in the picture, but wasn't sure how final that configuration is. Yes, G4ILO-5 is what it will be. I think the latest recommendations are that -13 should be used for weather stations but the firmware only allows a single character for the SSID. It will be a few days before I get the low power transmitter module working and sort out a weatherproof power supply.